60 years after the first drawing, the world still wants more. In 2017, exactly 60 years after the Moomins were created, a new Moomins animated TV series has surpassed its crowdfunding target, a Moomin Museum has opened and the first UK retrospective of Moomin creator Tove Jansson's stunning book illustrations and art has been scheduled. To celebrate all of this Moomin excitement, we headed to Finland to find out about the artist, her characters and the new Moomin reboot. Sitting in the late Tove Jansson's studio apartment in Helsinki, her niece – Sophia Jansson – is wondering how the Moomins artist survived with no kitchen in her home. “I suppose she lived on a diet of coffee and cigarettes,” she jokes. There are half-finished paintings and an abundance of books scattered across the modest living space, which comprises a bedroom, an open-plan living area and a mezzanine. Sculptures of Tove Jansson as a young girl, created by her father and fellow artist Viktor Jansson, are dotted along the shelves, and the steeple of the local church can be seen through the window. The artist resided in the apartment for almost 60 years, after moving in 1944. Her life partner, fellow artist Tuulikki Pietilä, lived in the same building. While the pair didn’t hide their relationship, it was illegal to be gay in Finland at the time. Sophia Jansson tells us how the couple would often work on their projects in their homes and then join each other for breaks – for coffee and a cigarette, perhaps. Jansson originally created the Moomins towards the end of World War II, eager to escape the monstrosities of everyday life at that time. These characters went on to become one of Finland’s most beloved brands – and one of its most profitable, garnering over €700m in Moomin-related sales every year. It’s no surprise then, that the world’s first Moomin Museum opened its doors in June in Jansson’s native Finland. Based in Tampere, the museum boasts 300 drawings and paintings and 30 tableaux, donated by Jansson before her death in 2001, alongside work by modern Finnish artists. An immersive and interactive experience, it’s testament to the Moomins’ longevity. So why do these little characters continue to inspire? There’s a reason why the Moomins have stood the test of time. The strong moral messages of the tales, teamed with timeless illustrations and universal themes have allowed Jansson’s stories to reach far beyond Finland’s shores. Piñata creative director Tuomas Korpi – who is currently working on the all-new Moomin animation series – says it’s these universal themes that keep the Moomins modern. “The issues in the stories are universal, and the storylines combine the fantastical and the everyday so perfectly,” he says. “The characters are relatable, too – there’s an adventurous little Moomintroll in all of us, but sometimes we’re scaredy-cat Sniff,” adds Piñata designer and illustrator Jonna Uhrman. Jansson’s work continues to inspire Finnish designers today. “Her original artwork is so deeply impressive and well put together. There’s magic in everything she created – both the stories and the illustrations,” continues Uhrman. Jansson was a rebel with a creative cause. She went against what was considered the norm and in turn, produced characters that every person around the globe could relate to. In one of her very first paid commissions at the age of 15, she openly mocked Hitler and Stalin in caricatures for liberal satire magazine Garm – a bold move for a country in the middle of a war. As we mentioned before, Jansson was also in a relationship with fellow artist Tuulikki Pietilä at a time when being gay was still illegal in Finland. They worked on a huge range of projects together, with many of their collaborative tableaus on show at the Moomin museum. Jansson brought this rebellious edge to her Moomins – creatures who took a chance on life and opened their hearts to the unknown. There’s Little My and Sniff, who live happily in the Moominhouse despite not being related to the Moomins. There’s also the philosophical thinking of Moominpappa and the wandering vagabond Snufkin. And of course, there are all the life-changing adventures the Moomins embark on, never giving into fear and turning back. Jansson not only created Moomintroll and his parents, Moominmamma and Moominpappa, but a whole range of characters with a depth and charm of their own. The Moomins are all about acceptance, with Moominmamma ensuring that the Moominhouse is always a safe and loving place – both for her family and for visitors. These characters can inspire others, not just morally, but creatively, in terms of ensuring diversity. Like Jansson, it’s important to include things that aren’t always the norm. One of the biggest characters in Jansson’s work is not really a character at all – Moominvalley is perhaps one of the lushest and most visually stunning environments an artist and author has ever created. “Nature features so largely in her artwork – forests, islands, seas – which is partly a Scandinavian thing, but Tove always made them more exciting and exotic,” Korpi says. This Scandinavian influence runs throughout Jansson’s work, with Moominvalley mimicking Finland’s lush forestry. “One of her characters might wander into a normal-looking forest, but then stumble on impossible, giant flowers and a crocodile – not things you would normally expect to find. She created places that I wanted to visit, places that were familiar but new,” Korpi adds. Tampere, where the new museum is based, is a quaint city that sits between the Näsijärvi and Pyhäjärvi lakes, with the Tammerkoski rapids in between. You can spot the water (and its floating saunas) from the Pyynikki observation tower. On entering the Moomin museum, you're surrounded by the sights and sounds of another world. Due to the delicate nature of Jansson’s work – it’s mostly sketched on paper – the lights must be kept low, which only enhances the mood of escapism. One moment you're standing in a giant Hobgoblin’s hat, watching a flower spawn from your silhouette; the next, the sound of a comet shoots across the room as you stand below a fire-coloured glass sculpture. The winter area offers a quiet, reflective atmosphere as digital snow falls in front of giant pebble-shaped seats, while an extraordinary Moominhouse tableaux takes attention to detail to the next level. One particular gem is the area created for visually impaired visitors, where attendees can feel what a Moomin looks like. 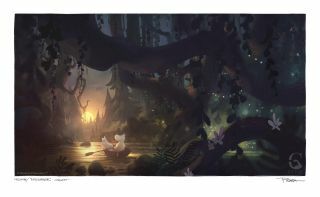 The new Moomin animation series that Korpi and Uhrman are currently producing is testament to the Moomins’ versatility. “Love, peace and solidarity – there should always be room for those kinds of messages!” adds Uhrman. Gutsy Animations ran a crowdfunding campaign that raised over $250,000 towards the visual development of the new animation, and the Finnish production company will be joined by a team of award-winning British Oscar-, Emmy- and Bafta-winning designers, animators and illustrators. Using an innovative 2D/3D hybrid technique, the animation will be modern, while also paying tribute to the traditional aspects of Jansson’s work (as the video above shows). The all-new 52-episode animation series is set for release in spring 2019, directed by Academy Award winner Steve Box (Wallace and Gromit: The Curse of the Were-Rabbit). If the museum and animation aren't enough, Moomin fans can also grab the first Moomin novels in Special Collectors’ Editions in October 2017, released to coincide with the opening of the Tove Jansson retrospective at Dulwich Picture Gallery in London. The Finn Family Moomintroll book will even include the original fold-out map of Moominvalley, says publisher Sort of Books.